My first impressions of Kurokami were positive indeed. An anime that contains fast-paced action, the fate of the characters, as well as eminent doom to come is quite entertaining to watch. 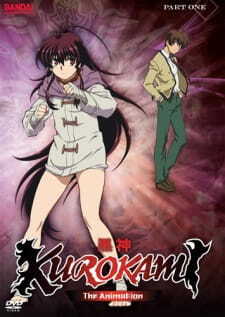 Just what is Kurokami and why is it so good? If you combine elements from Toaru Majutsu no Index, Shakugan no Shana, Darker than Black and The World Ends With You, then your result will be Kurokami. Similar in story, the anime is basically about an average guy that seems to encounter misfortune all around him thus resulting him being socially reclusive. One day, he encounters a mysterious girl that has special powers. He then tries to save her whilst a fight goes on resulting him being gravely injured. The girl then saves him by forming a contract with him. Now, being bound together by fate, the duo have to overcome the constant misfortune that befalls them and to destroy the terrible "Doppeliner System" that seeks to destroy humanity. If you related the story with any of the titles I mentioned before, then you will like this anime a lot. For me, I am a huge fan of the mentioned anime and so I totally enjoyed watching this anime from start to finish. The story is fast-paced and seem to through into multitudes of plot twists, fights and characters at every corner. In the end, you are not totally confused at what happened but you get to broadly understand what is going on. The art was simply amazing from the beautiful sceneries down the the finest detail of the characters. The battle animations were simply well choreographed and executed perfectly. There were no frame rate issues or jagged edges in the animation anywhere and everything was in high detail. There was consistency in the depth of detail even in the quick action fight scenes that make use of fast movement. I also noted that the markings for the synchro somewhat reminds me of the 'noise' in The World Ends With You. No complaints here. The theme songs were pretty catchy using some rock tunes for the opening song and a slow melody for the ending; they both suited the anime really well. Voice acting was perfect for the characters and they displayed plenty of emotions that can be clearly picked up from their voices. There were plenty of sound effects to complement the awesome fight scenes. The anime seems to throw in a new character at every turn. So in the end, you don't really get to know most of the character's backgrounds and personality that fully. Ibuki Keita is somewhat a bit of a jerk at the start but slowly warms up to the rest of the characters as the show goes on. You can't help but feel sorry for Kuro as she is somewhat a bit naive and usually at the end of Keita's abusive comments. Of course though, that all changes towards the end when there are greater enemies lurking throughout the city and being in sync is most important for the survival and ability of the duo. What other anime has a mascot? Not many, but Kurokami does feature a cute sausage dog named 'Punipuni'. Overall, it was fun, exciting, and adrenaline-rushing. There was little room for side-stories and fillers which made me constantly want to watch more. Most episodes ends with a cliffhanger that leads on to something greater to encounter in future episodes. In the end, this can be considered a very good action, fantasy, special powers anime. I would definitely recommend it to anyone who are into these type of anime. Simply engaging, fast, gets to the points, and doesn't disappoint. With plenty of plot twists, new characters, and fights, this is one anime that does not disappoint. Simply stunning and amazingly animated. Enough said. Theme songs were quite catchy and suited the anime really well. Voice acting was perfect. Plenty of characters that tend to turn up randomly. Not much character development here but there's no time for that. I enjoyed the fights, the plot twists, the characters, everything. It was a well executed anime. It is one of those fast-paced anime that keeps rushing forwards without looking back, if you don't keep up, you will be confused. Just forget about the story as a whole and enjoy what's happening right here, right now.